On the 20th of October 2018, Kachifo Limited launched its new e-bookstore, farafinabooks.com. 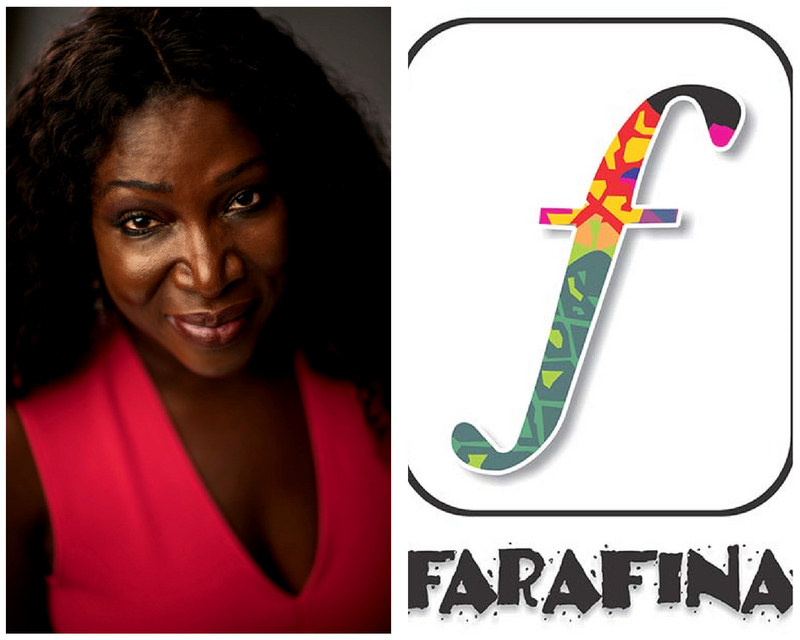 Now, you can buy and read, on your devices, your best-loved titles from any of our imprints: Farafina, Tuuti, Breeze and Kamsi. In November 2018, Channels Book Club will be taking the three best participants of its book review essay competition on an exciting sponsored trip to the world’s third biggest book fair, the Sharjah International Book Fair in Sharjah, United Arab Emirates. The competition is open to secondary school students all over Nigeria. in my Wardrobe, in November 2018 under its Tuuti imprint. and has made its home in her wardrobe. scene by the Globe and Mail. Here is an excerpt from The Stress Test by Mojisola Aboyade-Cole. He took a seat beside Taramade and their thighs made contact. He noticed how swiftly Taramade moved hers away. Felix glanced at her and, for a brief moment, fought to control the uncomfortable tightness in his groin. “You will sign my stuff, Oyinbo, before you take off,” he said. “Do you know what happened to your sister-in-law?” Dr. Johnson asked. Felix listened half-heartedly as Dr. Johnson gleefully repeated the fiasco with the market women, making Taramade feel like a fool. Uninterested, Felix cut in at the first chance. “Mummie, see what your only son has done for the bank,” he said. “This deal is from Yinusa Ahmed.” He signalled to one of the young interns who had taken a position by the door. She approached with a file and handed it over to Dr. Johnson. She went through it, clapping her hands in delight. “Oh my son, this is a very good one. We are finally sponsoring a polo tournament. No bank has done this!” she said, signing her approval. Felix passed the file to Taramade and collected another from his intern. “How much are we throwing to the wind, Felix?” Taramade asked him with caution. Felix let out a loud yawn. Taramade had become Miss Righteous. He wanted them both to work together to wrest the bank from Dr. Johnson; it was time for her to hand over the baton. One of his own contemporaries had just been appointed MD of a bank. That guy was set for a financial transformation! And yet here he was, being queried by his brother’s wife and playing the gigolo to his stepmother for mere handouts from a bank that was rightfully his. He had told her many times that her extreme loyalty to Dr. Johnson would backfire. Did she not know that Dr. Johnson had just purchased a private jet for her prophet, and yet he, Felix, did not have one? Dr. Johnson had enough money to create a royal kingdom. Meanwhile, he had to seek her approval to settle his hotel bills. Felix was loyal only to himself. In his twenties, absorbed in a decadent lifestyle financed by his mother, he’d shuttled from one foreign country to another. He’d never visited Nigeria, not even for his father’s funeral. Guilt and regret were unfamiliar emotions for Felix, but they surfaced when his brother, Frank, became incapacitated. Only then had he returned to Nigeria. It still hurt to see his brother in his current condition. Felix had never had that much time for his mother. At first he had ignored his stepmother, not understanding her strong desire for his approval. When he mismanaged what was left of his father’s estate, he succumbed to her entreaties for a closer relationship and she was eager to pay for it. Only later did he learn that whatever she gave him she took back a hundred times more. But things were about to change now, leveraging on the current financial crisis was his key. Dr. Johnson had to be removed, and with Yinusa’s help and direct link to Aso Rock it was going to happen soon. It would not be easy getting rid of his stepmother, but Felix prided himself on being a risk-taker – the bigger the transaction, the more desperate he was to corner it at any cost. Taking ownership of the bank was a transaction that would definitely turn out to be a thrilling ride. Typical, Taramade thought. She was always on his side. “What is this about, Felix?” Dr. Johnson asked, now suspicious. She recalled the meeting with the TBN governor accusing her of lacking financial discipline and integrity. All of Felix’s society friends had taken one form of loan or the other, and they were not repaying. It was always billions for gambling on shares, property or for oil and gas transactions with worthless and overvalued assets as collateral. She had to stop trying to please him all the time. The obsessive behaviour had to end. 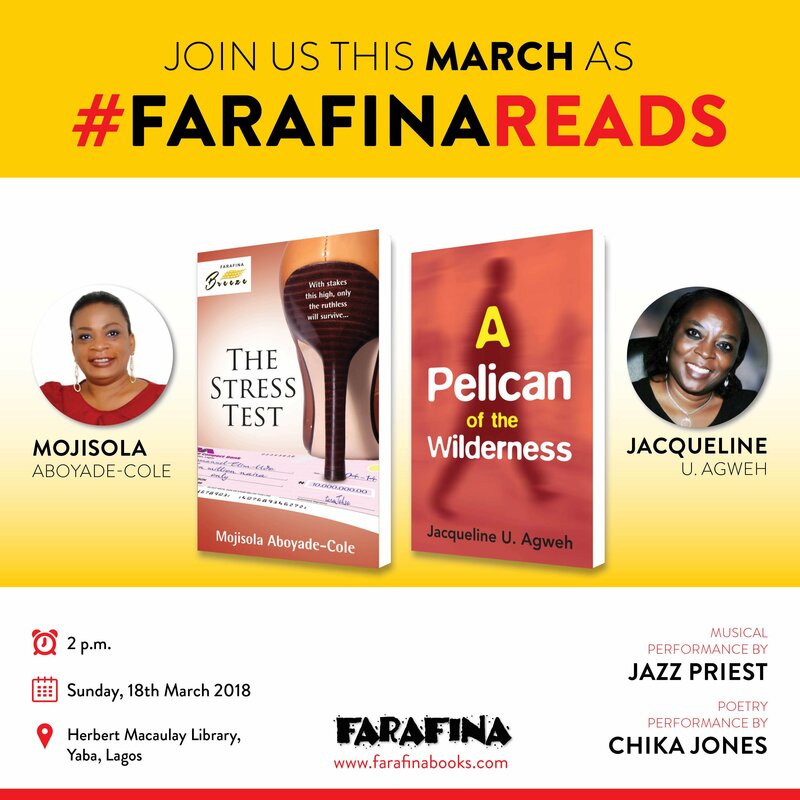 The author of The Stress Test will be at the FarafinaReads event this March. 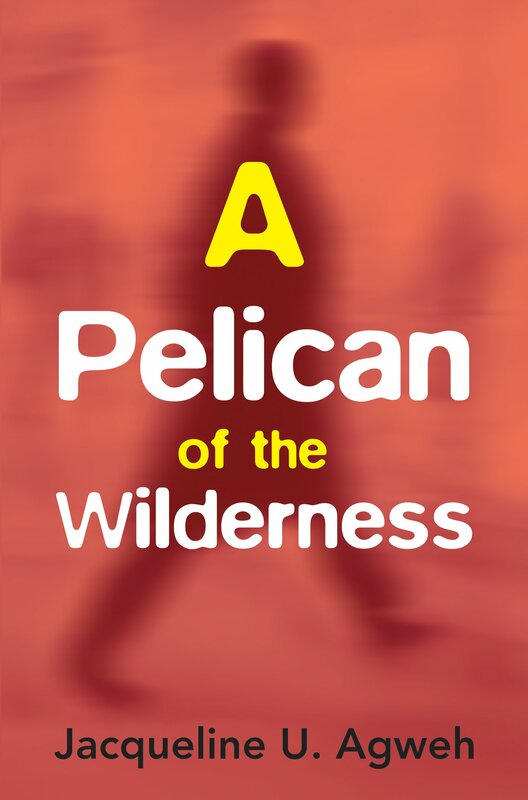 Here is an excerpt from A Pelican of the Wilderness by Jacqueline U. Agweh. At that point, Tonpre’s mouth fell open. What was happening here? They were stripping him naked psychologically as their leader’s eyes danced merrily, not for once shifting off his face as he absorbed the shock. Tonpre admired their thoroughness. Spitfire was not even reading from any document; he had memorised it! “…A Masters degree in Industrial Chemistry from Leeds University, United Kingdom. Tonpre Isaac-Kogbara junior returned to the country in September 2004. He worked for two years with The Southern Hemisphere Corporation as a senior marine engineer. Tonpre was shaking. He longed to run far away from these dangerous men who were picking his past, his present, and maybe even his future apart. A smile stole across Tonpre’s lips, Doyin would love this resume. With that, Spitfire concluded the citation, bowed slightly and took his seat. None of the men were looking at him, but Tonpre still felt uneasy and exposed. It was eerie listening to someone talk about him like he was not there. His head was reeling in confusion. How had they collected so much information about him? And it was all accurate too. Nobody spoke. The leader was not staring at him anymore; he seemed more interested in the wall to the right. Suddenly it was lit up by a projector. Slowly, it projected photographs, leaving him gasping as his baby photographs zoomed past in slow motion: that was his first birthday; and that one, the trip with his parents to Yankari Games Reserve when he was eleven. The next one was his convocation ceremony at The University of Lagos auditorium. Reel after reel of family history glided past, each one bringing back mixed feelings of days long gone. Then, Doyin’s smiling face slid by. Nobody, apart from him, Doyin and Udeme, his housekeeper, knew about this photograph. His head felt light, he cast a quick glance at the hanging door and noticed the two guards were still stationed there. Tonpre swallowed and nodded, his legs were beginning to grow numb from standing for so long. He began to reel out the dos and don’ts of the brotherhood until Tonpre lost track. Tombra marched briskly up to Tonpre. There was no reassuring expression on his face as he raised Tonpre’s right hand. He folded it into a fist and jabbed his own clenched right fist onto Tonpre’s as he began speaking. “Tonpre Isaac-Kogbara,” Tombra said slowly, staring right into Tonpre’s eyes, “you will from today be known to us, the Signet Brotherhood, as The Pelican.” No applause followed the declaration. Tombra pulled a small black case from his pocket, opened it, and exposed a signet ring. It had the image of a pelican bird engraved on it. “Take it and wear it on the little finger of your left hand.” Tonpre obeyed. “A pelican symbolises selfless sacrifice. We expect nothing less from you.” Tombra gave him a stiff embrace and led him to the only unoccupied seat. Thereafter, it would be his permanent seat at Brethren gatherings. Tombra then marched back to his own seat. “Si ye o fo ri! The bond is unbroken!” the men roared headily in one voice. They were one man stronger. The leader sat down, signalled the men to sit, and only then did he introduce himself. No one else was introduced. The author of this novel will be at the FarafinaReads event on Sunday, 18th of March, 2018. 2018 is the year to read more, isn’t it? This tweet by Wale Lawal proves this much, with its many retweets and likes. However, it can also be overwhelming to decide which books to start with. Especially books that will keep you asking for more. So, here are 4 books to start your New Year book resolutions with, especially if you are looking to read more African literature. In her novel, Yewande writes about two prickly old women, one black and one white, who discover, after 20 years of exchanging digs and insults, that they might help each other. Hortensia and Marion are anything but friends and would like it to remain that way. But then a repair project leaves Hortensia with a broken leg and Marion in need of temporary housing. Published by Kachifo Limited under its Farafina imprint, this is one book to start the new year with. Buy it here. Olanna is a beautiful London-educated woman who abandons her life of privilege in Lagos for a dusty university town and the charisma of her new lover, Odenigbo. Soon after their new life begins, the Nigerian Civil War starts. As Nigerian troops advance and they and their loved ones run for their lives, their ideals are severely tested, as are their loyalties to one another. Adenle’s novel entertains from beginning to end. This compelling crime novel is set in contemporary Lagos and features Guy Collins, a British journalist, who is found close to a mutilated body, discarded by the side of a club in Victoria Island, and is picked up by the police as a potential suspect. Collins soon finds out there is more to Lagos than just its bustling traffic. The House My Father Built is a memoir of a ten-year struggle between the author and his “inherited” tenants. After inheriting a house in Surulere from his late father and waiting ten years for the terms of the inheritance to be fulfilled, Maja-Pearce is eager to take possession of his house. So he offers his tenants a one-year rent-free break, after which they are to vacate his property. Little does he know that, when the time comes to leave, his tenants would put him through one of the fiercest, and probably the most ridiculous, battles to stay put.